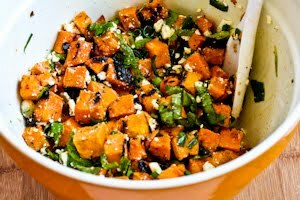 This Vegetarian Grilled Sweet Potato Salad with Green Onion, Basil, Thyme, and Feta is perfect if you need a healthy recipe that’s a bit special for a summer pot-luck! And this tasty salad is gluten-free and South Beach Diet friendly. Use the Recipes-by-Diet-Type Index to find more recipes like this one. Click here to PIN this Vegetarian Grilled Sweet Potato Salad! 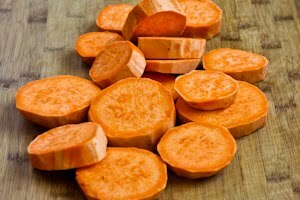 I haven’t always been a big fan of sweet potatoes; in fact I only started liking them after I realized they had lots of recipe possibilities besides the brown-sugar-and-marshmallow topped baked sweet potato casserole I’d known as a kid. I’m not sure where I got the idea for grilling thick slices of sweet potatoes and using them in a potato salad with vinaigrette dressing, green onions, Feta, basil and thyme, (and it took me two tries to come up with a combination that seemed just right) but this Vegetarian Grilled Sweet Potato Salad with Green Onion, Basil, Thyme, and Feta was so good, and leftovers were tasty, even after a few days in the fridge. If you live in the U.S., the red sweet potatoes I use in this recipe may well be called “yams” or “sweet yams” in your grocery store. Many people are confused about the difference between sweet potatoes and yams, but you can refer your store’s produce guy to Food Blogga on Sweet Potatoes vs. Yams if they don’t believe you! You can probably make this recipe with white fleshed sweet potatoes too, but I loved it with the orange-fleshed ones you see in the pictures. Peel sweet potatoes and cut into slices about 3/4 inch thick. 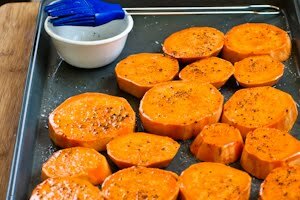 Put the sweet potato slices on a baking sheet, then brush both sides with dressing and season with sides with salt and freshly ground black pepper. Then flip sweet potato slices over and grill 7-8 minutes more on the second side, for a total of 15-20 minutes grilling time. Actual grilling time will depend on the temperature of your grill, and I started checking with a fork after about 12 minutes, and moved the sweet potatoes off the grill as they got tender. Let sweet potato slices cool for a few minutes, then cut them into cubes and put in salad bowl. Gently stir in the crumbled feta, season to taste with salt and freshly ground black pepper and serve salad at room temperature. This would taste great with something like Marinated Flank Steak or Curried Grilled Chicken, both of which could be cooked on the grill after you take off the sweet potatoes. Peel sweet potatoes and cut into slices about 3/4 inch thick. 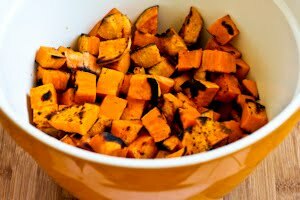 Lay slices on a cookie sheet, then measure 1/4 cup vinaigrette and brush each side of sweet potatoes with dressing, seasoning each side with salt and freshly ground black pepper after you brush on the dressing. 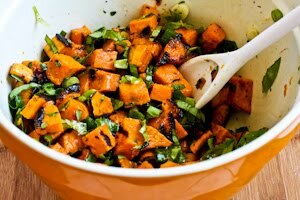 Let grilled sweet potato slices cool for 10-15 minutes, then cut into cubes and place in salad bowl. Add sliced green onions, chiffonade basil strips, and chopped thyme and gently combine with sweet potatoes. Stir in the other 1/4 cup of vinaigrette, using as much as you need to moisten the salad (you may not need all the dressing, depending on how wet you like your salads.) Gently stir in the crumbled feta, season salad with salt and freshly ground black pepper to taste, and serve salad at room temperature. I had a small container of leftover salad that was in the fridge for 2 days, and it still tasted great, but you may not have any leftovers! This salad would be a great side dish for phase 2 or 3 of the South Beach Diet, and it’s also low-glycemic and gluten-free. 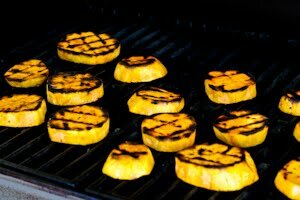 If you want less carb, use some grilled zucchini to replace some of the sweet potatoes, but the recipe as written is definitely not low in carbs. I love the sound of this recipe, but I have one problem … NO GRILL. Is there a way of using the oven to roast these without adding a lot of fat? I truly would love to try this recipe. Any help would be appreciated. Also, feel free to post you're recipes or you're favourite foodie tips on it whenever you like! Mary, thanks to you and your sister-in-law both! I loved this when I made it; so glad you guys are enjoying it too. Amazing recipe! Thanks so much. I shared your blog a few months ago with my sister-in-law and she is the one who discovered this recipe and has been making it this summer, including last night's picnic. I need to finally make it myself. Keep up the good work! Oh good, so glad you are enjoying it! I've made this several times this spring/summer and it's fast becoming a family favorite. My son has requested it several times. We love it! Took the recipe on vacation with us so we could have it while away. I do like the idea of using red bell pepper in this; thanks for sharing that! Glad you enjoyed it. Ohhh, this was so goooood! I also have a basil plant, and I'm always so excited when I get to use some in a dish. For the dressing I used mirin, red wine, and apricot marmalade, which was reallt good. I'm still in need of a grill, though, but this turned out all right in the oven. Have you ever thought of adding red bell pepper? I did that, and ended up with roasted bell pepper, which I though was marvelous. Thanks for the great salad! Jenna, so glad you liked it. Sounds like your garden is doing well! I fired up the old charcoal and made this last night! Delish! Thanks for the recipe! I just shook together some olive oil, balsamic and trader joe's everyday seasoning. Yum! AND I got to use thyme, basil and green onions from my garden! The sweet potato would pair well with the salty feta in this salad! Carrie, so glad you liked it! This was absolutely wonderful! Thanks so much for a quick and delicious recipe! Puttering in the Midwest, probably still pretty good. If you can use garlic, I might add some chopped garlic to the oil, and maybe a little more green onions and basil. Hope it turns out for you with those changes. Kalyn, I have recently been diagnosed with a IC a condition that effects the bladder and Vinegar is an absolute no no. I was wondering how you thought this would be with an infused olive oil only? This is one georgous & excellent sweet potato & veggie salad!! I made a similar salad last week, but haven't had time to post it:) I will have to try your version soon. This is such a nice combination of sweet and salty from the grilled caramelized potatoes and the feta. Sounds like a perfect summer salad! Yum! This would be perfect with my lemon thyme that I planted this year! I often grill sweet potatoes and then toss with lime juice & cilantro then serve over quinoa that is mixed with pinto beans, chipotle, & lime vinaigrette! Yum! I have never grilled sweet potatoes before – what a great idea to bring out their deep, rich flavor. And the grill marks look pretty cool, too! Our mothers must have made sweet potatoes the same way – with marshmallows! Mine even put pineapple in hers once. So I grew up hating sweet potatoes. Now I can't get enough. I've been known to bake a sweet potato and have it for dinner, all on its own. What you've done here is splendid, Kalyn. It's already on my weekend menu! Babs, I think coarsely grated parmesan would be good. This sounds like a great idea for sweet potatos but we don't like feta or gorgonzola. But making it with no cheese doesn't sound as interesting. Maybe a milder cheese would work? I really wasn't a sweet potato fan until I started eating healthier foods and now I can't get enough! Love this salad. 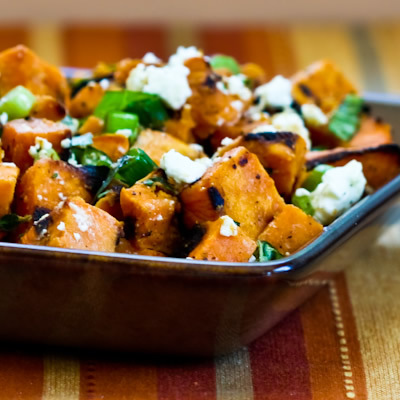 Sweet potato and feta…nice combination! I loathed the sweet potato / marshmallow thing…. Love sweet potatoes, though. We'll start seeing them again in late summer – time to try them on the barbecue – I love this salad! today i use sweet potato too, but i fried it, not too healthy version. Your look healthy and refreshing. I'm glad people are liking this! It's funny because I saw a Grilled Potato Salad from Bobby Flay in today's Parade Magazine. Julia, no special reason I used store-bought vinaigrette except I like that dressing and I knew it would be good with the basil. You can certainly make your own dressing if you prefer. 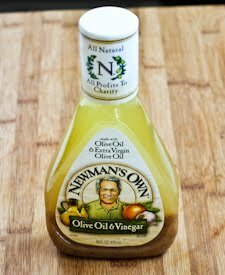 I am wondering, is there a reason why you used store-bought vinaigrette, as opposed to homemade dressing? I think I might try this for my husband. He insists he doesn't like sweet potatoes (yams) but I think this recipe will maybe convince him. Sweet potato salad would be a heart healthy alternative to classic potato salad. This recipe is going to the top of my list, Kalyn! Wonderful combination of herbs. 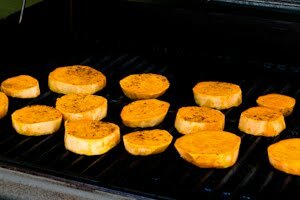 I have tried grilling sweet potatoes several times in the past and always had great results – the flavor is irresistible. This looks delicious! My herbs are going crazy right now, I think I'll have to try this! Thanks Kalyn, it looks delicious, as always! Brilliant! I would never have thought to pair sweet potatoes and basil. I love this! I tried a similar one (from Bobby Flay, I think) and it was good, but a little too tangy for my liking. This looks right up my alley,though! Especially with the addition of the feta!